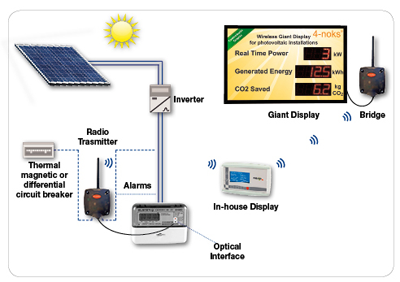 Energy+ introduces wireless Giant Display for monitoring large photovoltaic systems. The intelligent way to display the real-time power in kW, the energy generated in kWh or MWh and the CO2 emissions saved in kg or tonnes. The Giant Display can help you display the data from multiple systems on a single Giant Display, even if they are located at separate sites. Monitor the energy performance of your photovoltaic systems and have the results presented on a Giant Display . Publish plant data via your website or via LCD monitor connected to the internet.